House Republicans unveiled the text of our tax reform bill Thursday. Representatives from Great River Energy, Basin Electric Power Cooperative, and Minnkota Power Cooperative traveled to Washington, DC to participate in a meeting I coordinated with Department of Energy Deputy Secretary Dan Brouillette to discuss the grid resiliency pricing rule, DOE R&D support, and refined coal and carbon capture tax credits. 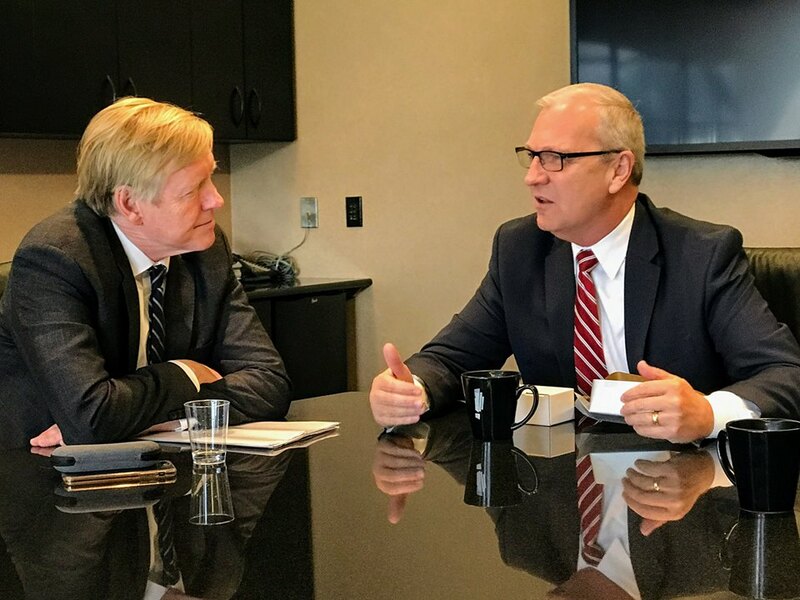 Last Monday, I met with Norwegian Ambassador to the US, Kåre Aas to discuss trade, energy, security, and investment between our two nations in Grand Forks. And, a bill I introduced passed the House of Representatives on Monday. Continue reading for more about these and other topics below. 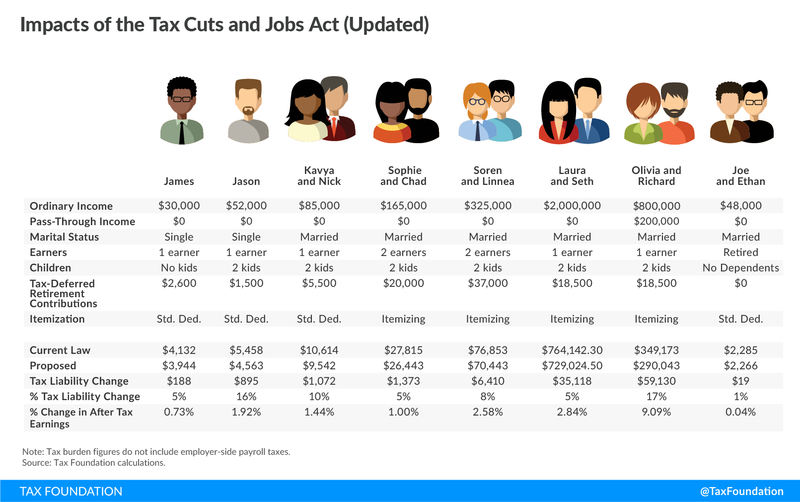 To learn more about the Republican tax plan visit www.fairandsimple.gop, or text TAX REFORM to 50589 for regular updates. The House of Representatives Monday approved Congressman Kevin Cramer’s bill, the National Forest System Vegetation Management Pilot Program Act of 2017 by voice vote. The National Forest System Vegetation Management Pilot Program Act of 2017 (H.R. 2921), sponsored by Rep. Kevin Cramer (R-N.D.) and co-led by Rep. Jared Polis (D-Co.), authorizes the U.S. Forest Service (USFS) to create a privately funded pilot program to conduct limited and selective vegetation management near utility infrastructure outside of a right-of-way. “Over the past few months, catastrophic wildfires have swept across the Western U.S.,” said Polis. “Getting trees and brush out of the way of power infrastructure reduces the risk of dangerous fires ever starting. By more carefully managing vegetation, we can prevent catastrophic forest fires and improve air quality, avoid costly damage to utility infrastructure, protect homes, and save lives. I’m proud that we are moving forward with this bill with unanimous, bipartisan support from the House of Representatives.” Read more here. Read the article E&E News published about the legislation here. Over the last 8 years policy was stacked against our coal and power producers, but with help from the Trump Administration we can keep our baseload and be the innovators. Thank you U.S. Department of Energy Deputy Secretary Dan Brouillette for taking time to discuss the grid resiliency pricing rule, DOE R&D support, and refined coal and carbon capture tax credits with North Dakota power cooperatives. Meeting participants included representatives from Great River Energy, Basin Electric Power Cooperative, and Minnkota Power Cooperative. Congressman Kevin Cramer supported a bill passed out of the House of Representatives Friday extending funding for the successful State Children’s Health Insurance Program. “The CHIP program provides care for some of the most vulnerable children across the nation, and this should have been reauthorized months ago, said Cramer. “Unfortunately, what’s typically a bipartisan bill, has been held up by Democrats who are opposed to adding a small premium to Medicare recipients making more than a half-million dollars a year to help pay for children’s health insurance. Unlike the Senate’s companion bill, the House is taking the fiscally responsible step of ensuring our bill is fully paid for and will not increase the federal deficit. I strongly urge the Senate to take up this bill as soon as possible.” Read more here. 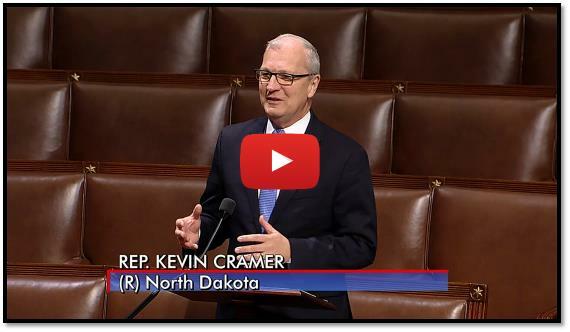 Congressman Kevin Cramer supported a bill passed by the House of Representatives today repealing the dangerous Independent Payment Advisory Board, which allows unelected Washington bureaucrats to make unilateral cuts to Medicare with little accountability or transparency. Created as part of Obamacare, the Independent Payment Advisory Board (IPAB) created a new federal agency with the authority to unilaterally alter Medicare spending. If the American people disagree with IPAB’s changes, Congress can only overturn the ruling with a supermajority vote  an unprecedented amount of power given to an unelected agency. “Putting so much power in the hands of an unelected few is not only unwise, but goes against the very fabric of our democracy,” said Cramer. “IPAB epitomizes the ‘Washington knows better than you’ mentality, and with such strong bipartisan support for repeal, I would hope the Senate can move this legislation in order to protect our seniors from unaccountable cuts made to the Medicare program.” Read more here. To watch this week's interview, click here for part 1 and here for part 2. It was an honor meeting with Norway Ambassador Kåre Aas in Grand Forks Monday to discuss trade, energy, security, and investment between our two nations. With more than a third of North Dakotans being of Norwegian descent, Norway is one of our closest allies and I appreciate the Ambassador for coming here to build on our already strong relationship. 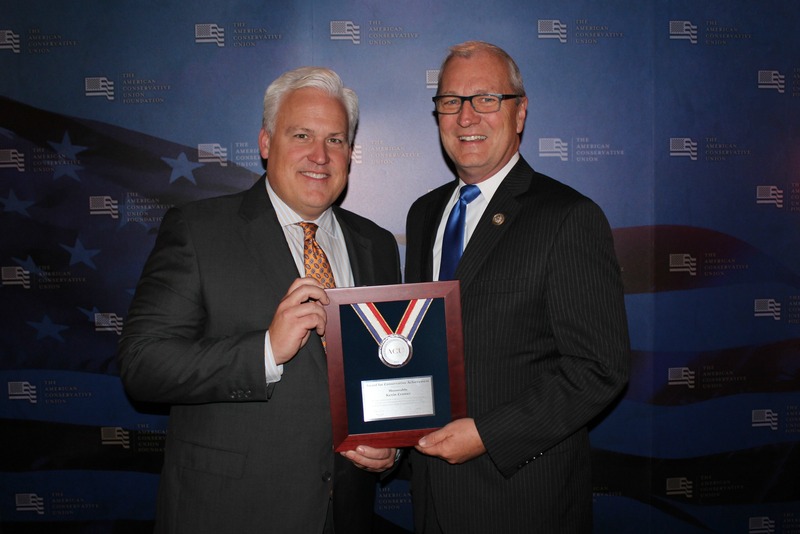 Honored to receive the Award for Conservative Achievement from the American Conservative Union Foundation. 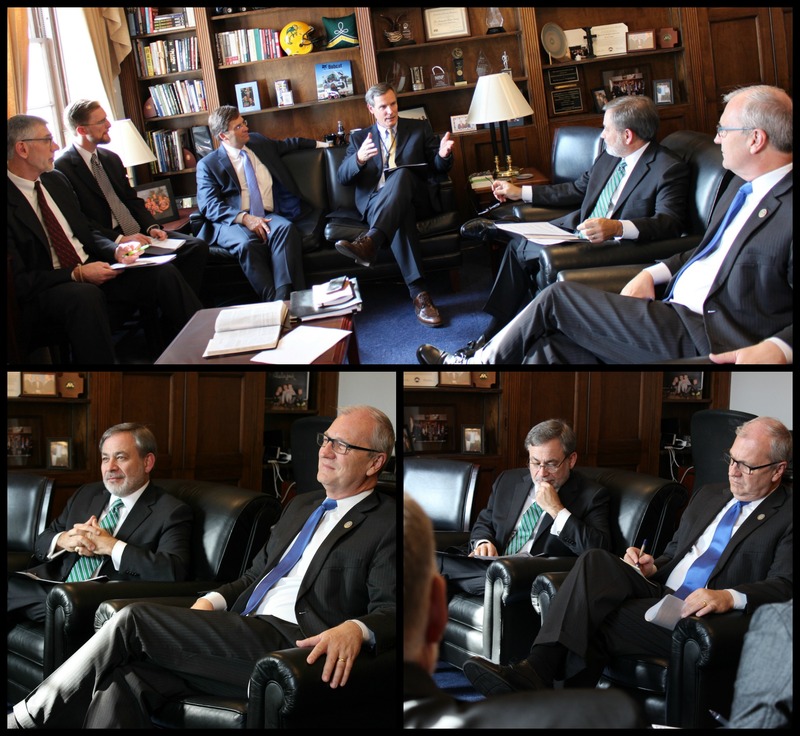 Discussed the importance of ensuring individuals with disabilities have opportunities for employment and education with Brent Askvig from ND Center for Persons with Disabilities. Visited with MN Fed Reserve President Kashkari about how to ease the regulatory burden on our small financial institutions, the new Fed Chair nomination of Jay Powell, and the House tax reform bill. The application for the 2018-2019 White House Fellowship is now open. Founded in 1964, the President’s Commission on White House Fellowships is the Nation’s premiere program for leadership and public service. The White House Fellowship offers exceptional Americans first-hand experience working at the highest levels of the Federal Government on a strictly non-partisan basis. Selected individuals spend a year in Washington, D.C., working as full-time, paid government employees aiding Cabinet Secretaries, senior White House staff, and other top-ranking government officials. The program has fostered a remarkable legacy of leadership. Of the more than 700 alumni in the last half-century, scores have gone on to top positions in the military, in business, in education, in the media, and in philanthropy. Current public officials who are alumni include: Representative Joe Barton of Texas; Transportation Secretary Elaine Chao; U.S. Ambassador to Japan Bill Hagerty; and Missouri Governor Eric Greitens. The 2018-2019 White House Fellowship program year will begin in August 2018 and conclude in August 2019. All applicants must be a United States citizen and have completed their undergraduate education. Federal Government employees are not eligible, with the exception of active duty military personnel. - A record of remarkable early-career professional achievement. - Evidence of leadership skills and the potential for further growth. - A demonstrated commitment to public service. - The skills to succeed at the highest levels of the Federal Government and the ability to work effectively as part of a team. Interested individuals may apply at: https://fellows.whitehouse.gov/. The application is available beginning November 1 and will remain open until January 10, 2018, at 5:59 p.m. EST. Any applications received after the deadline will not be accepted. For more information, including details about the Fellowship, its history, and the selection process, please visit: www.whitehouse.gov/participate/fellows. Any questions regarding the White House Fellows program can be directed to whitehousefellows@who.eop.gov. Kevin appears on seven radio stations and one TV station across North Dakota each week, taking questions from listeners and discussing current issues affecting North Dakota and the nation. You have received this e-mail because you are enrolled in our mailing list. Please DO NOT reply to this email. It is sent from an unmonitored account.